What is a corporate work? In every country in which it works, Opus Dei carries out social, educational and welfare projects. Its corporate works are all directly apostolic activities: training centers for farm workers, medical clinics in developing countries, schools for children from underprivileged families. Strathmore, pictured above, is a good example of Opus Dei's corporate works. Founded in 1961 in Kenya, Strathmore College grew steadily, and eventually became became Strathmore University and Strathmore School. The University has 2,200 students enrolled, including 100 from other African countries. It offers particularly strong programs in the fields of accounting and information technology. In the past 10 years, the College has provided 60% of the Certified Public Accountant finalists in Kenya. Strathmore entrusts its spiritual and doctrinal orientation to Opus Dei. Opus Dei, therefore, ensures that Christian ethical teachings on human dignity and social justice are made known at Strathmore, by including courses of ethics in the curricula of all Strathmore's training programs. 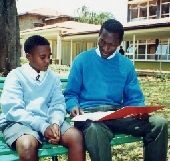 Opus Dei also provides Strathmore with a chaplain who gives spiritual counselling to anyone who may wish to receive it. I designed this site as a resource to help people understand Opus Dei better. It is unofficial and I would be happy to receive questions or suggestions at the above e-mail address.